P. omorika 'pendular' is a weeping variety with pendulous branches. 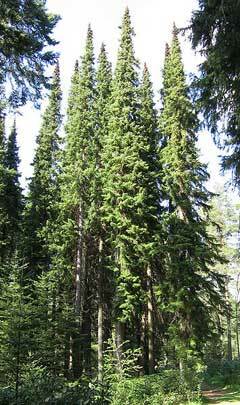 Picea omorika, commonly called Serbian spruce, is an evergreen conifer that is native to limestone soils in the upper Drina River Valley in western Siberia and eastern Bosnia and Herzegovina. 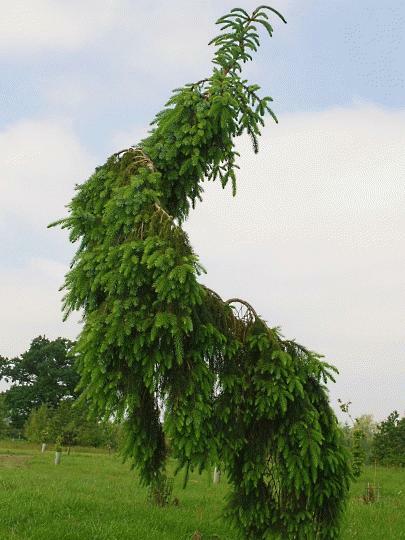 It typically grows to 50-60' tall in cultivation, but will rise to as much as 100' tall over time in its native habitat. This is a narrow, pyramidal, spire-like tree with pendant branches that ascend at the tips. Flattened bright green needles have silvery undersides. Brown bark cracks into scaly plates. Pubescent new shoots. Pendant cones (to 2 1/2" long) emerge violet purple but mature to yellowish brown. The genus name is reportedly derived from the Latin word pix meaning pitch in reference to the sticky resin typically found in spruce bark.